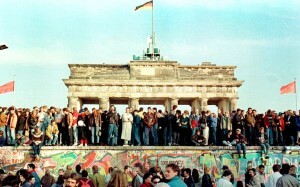 Exactly 25 years ago today, the Berlin Wall fell. Tonight, a concert at the Brandenburg Gate commemorated one of the most important events of the 20th century. It did so by releasing 8,000 white helium balloons which were illuminated and lined up next to one another over a nine-mile line; the same line along which the original wall, a guarded concrete partition, stood between the years 1961-1989. 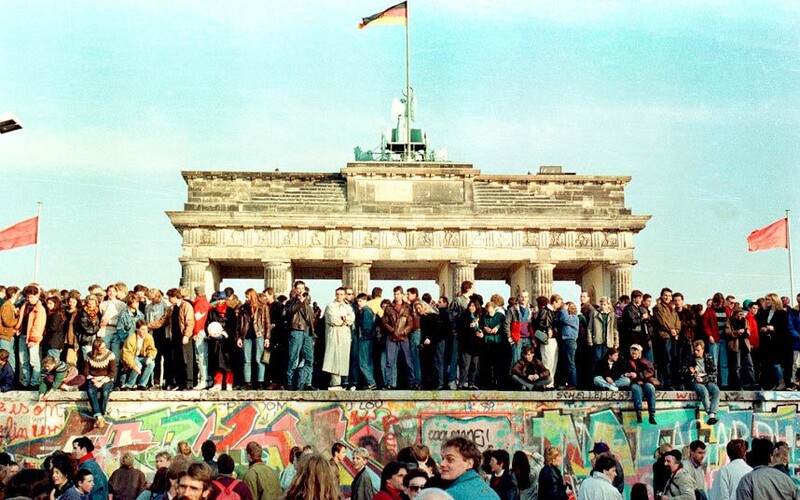 November 9, 2014 marks the 25th anniversary of the fall of the Berlin Wall. The white balloons were a work of art which, it was reported, took longer to erect that the original wall had. This was telling. People had gone to great lengths to ensure that the world did not forget what happened only a quarter of a century before. When the balloons were released, the wall floated away and, for a second time, disappeared. 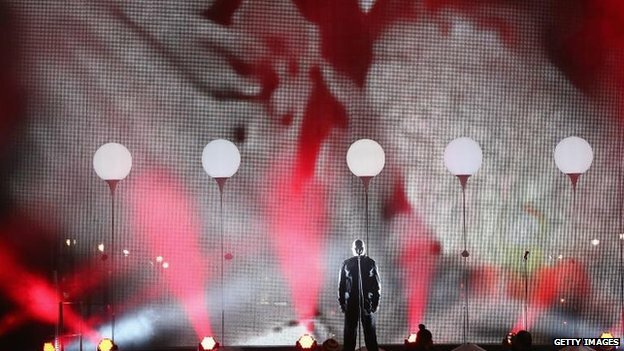 Peter Gabriel performs at the Brandenburg Gate party, 9 November 2014 with the white balloons representing the Berlin Wall. Another anniversary was also celebrated today, “Remembrance Day”. Importantly, this year’s celebrations commemorated the centenary of the First World War. Wreaths were laid all over Europe to remember what happened 100 years ago. Together, these two events alone could tell the story of the 20th century. The First World War eventually led to a Second World War and then a Cold War. Borders were drawn and re-drawn, the Berlin wall was erected and millions of people were affected- displaced, torn from families and loved ones or killed fighting for their countries. Nations were tested, old countries disappeared and new ones were formed. Allegiances were changed, sometimes unwillingly, and a new world order resulted. Politically and economically it was a remarkable century as new systems came into play and affected all those who were still around after surviving the bloody wars. The fact that the anniversaries (and significant ones at that) of these two watershed events occur on the same date is rather extraordinary. Conveniently, it allows us all to reflect upon the significance of events which made up the entire last century- the causes, consequences and conclusions- all in one day. For all of us writing and researching family history, we know that regardless of where a family resided last century or what their circumstances, they were, in some way, affected. Indeed, millions of family histories were rewritten; unknowingly for many as simple steps taken to survive the consistent hardships regularly resulted in upheaval within a family structure. Leaving one’s native country to seek a better future in another country did not necessarily mean the intention was to relocate an entire branch of a family tree forever, yet often this was exactly the outcome. Today, putting the pieces of the puzzle together for us, their legacies, is fraught with challenges but we hold a privileged position when we delve backwards into history to make sense of stories which were unravelled and try to piece them back together as if we ourselves took part in the events themselves rather than in just their anniversaries. A thought-provoking piece in this special week, month and year of remembrance. It made me think of the concept of ‘The short 20th century’, an idea proposed by the Hungarian , Ivan Berend, but subsequently defined by Eric Hobsbawm in his book ‘Age of Extremes’ . It refers to the period between 1914 and 1991, starting with the beginning of World War 1 , and finishing with the break up of the Soviet Union in 1991[ foreshadowed by the fall of the Berlin Wall in 1989]. Your piece reminds us of how the catastrophic world events of the era impacted on the lives of millions of ‘ordinary people’ on all continents – and how part of our work as family historians involves us in discovering how our ancestors’ lives were affected by those turbulent times.